We all know that Facebook has been under a lot of pressure to improve the security in its Apps and another flaw could be a disaster. Yesterday, Instagram faced a bug that affected millions of users whose Stories got exposed to strangers. Usually, the Stories are not visible to people whom you don’t follow, but a bug made that possible and it left people worried for their privacy. According to sources, people reportedly started observing Stories of people they don’t follow. This confused a lot of them and they didn’t understand why this was happening. Instagram later took note of this issue and confirmed that there was a bug which is causing this. A fix was also released eventually by the company for the same. Instagram is still looking into the cause of the bug but says it was solved within hours of being brought to its attention. 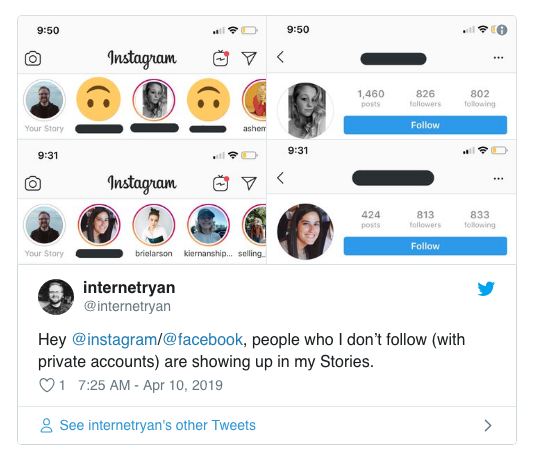 Luckily, if users clicked on the profile pic of someone they didn’t follow in Stories, Instagram’s privacy controls kicked it and wouldn’t display the content. The problem comes after a rough year for Facebook’s privacy and security teams. Outside of all its scrambling to fight false news and election interference, Facebook and Instagram have experienced an onslaught of technical troubles.